Please note the information below comes from the Mighty Peace Watershed Alliance’s website, for full meeting details please go there. 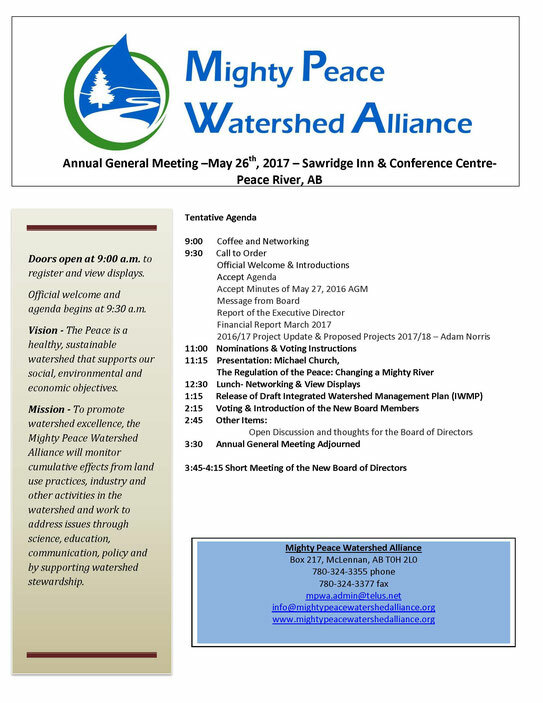 On May 26th, 2017 the Mighty Peace Watershed Alliance is hosting their Annual General Meeting in Peace River, Alberta at the Sawridge Inn & Conference Centre . The AGM is open to the public and is free to attend – please register (so enough materials and lunch will be available) before 12PM on May 19th, 2017 with the form below. To be a voting delegate at the AGM you must be a member, which is free to do using the membership form below. If you wish to be considered to be a board member please fill out the Nomination Form and send it to our office by May 19th, 2017. Notice of Bylaw information below. Please email all filled out forms to mpwa.admin@telus.net or fax it to 780-324-3377.